had a great jump lesson on Echo tonight! it was super hot again today, but i forced myself to push through to the end of the lesson... mostly because i really wanted to do the last course :D i know this means nothing to most of you, but my equestrians will get it. it was a 2'6 vertical bending line to another 2'6 vertical, roll back to a 2'9 vertical... and then the same pattern starting from the other direction. it went really well, love that mare! China Glaze Let's Dew It is the next polish in their The Great Outdoors collection! (it's a press sample, kindly provided to me for review). it's a glitter with small silver pieces and blue and purple micro pieces, suspended in a clear base! the coolest thing about this polish is that it shifts from blue to purple sparkles depending on which angle you look at it from! i feel like it would take a few coats to get it opaque on its own, so i layered it over a greY (China Glaze Change Your Altitude/press sample). i used two coats and it gave nice coverage... not completely opaque, but it gives that suggestion when used over a base color. i recommend using topcoat over all glitters and it seals in the pieces and brings out all the shinies! two coats Let's Dew It, over China Glaze Change Your Altitude, topped off with one coat Salon Perfect Crystal Clear Top Coat. (all are press samples). you can see a bit of the purple shift in the above picture... glitters are so hard to photograph! the next picture shows more of the purple... but i had to take it a bit blurry and at a funky angle to capture it. 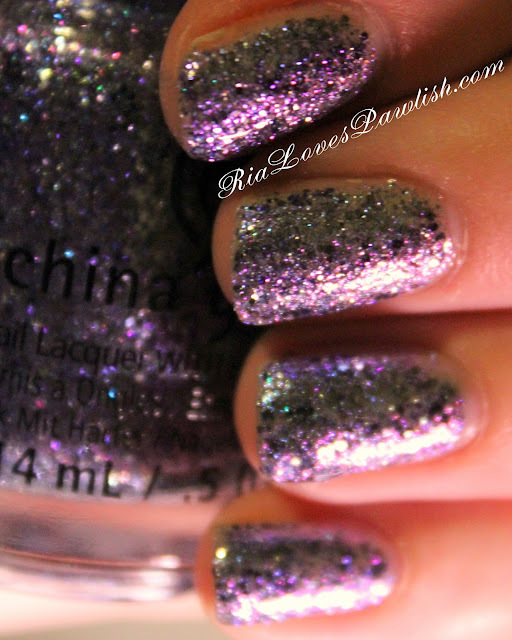 This is a really gorgeous glitter!